After reading Hex Hall earlier this year, I was so excited to finally get a chance to read Demonglass. I’m literally kicking myself for having waited so long to read this book. It was absolutely awesome; I was completely hooked until the end. Sophie is still the fun, sarcastic, loveable girl I knew from Hex Hall. After all the bad stuff she went through in the first book, her character has definitely grown. She’s easily one of my most favorite characters ever. We get to see some of Archer in the book, although not as much as in the first book. I really liked Archer from the beginning, even though I never know when to believe him. We get to see another side of Cal in the book as well. (Oh, to be in Sophie’s shoes right now.) Jenna is a really wonderful friend, and I wish she had a bigger part in the book. We are also introduced to Sophie’s dad in this book, who I really like, as well as some other interesting characters. The story was absolutely wonderful, and kept me guessing. There were so many different things going on, which made it really hard to put the book down. The ending is a huge cliffhanger. HUGE! I’m anxiously waiting for the next book to be released, because I need to know that’s going to happen next. Overall, I loved this book. I love this Series! I just can’t get enough of it. Happy Reading! Check out my review for HEX HALL! that is so funny you posted this review today.. I was just lying in bed thinking about ow awesome DemonGlass was and how I cannot wait(literally) for the third book! 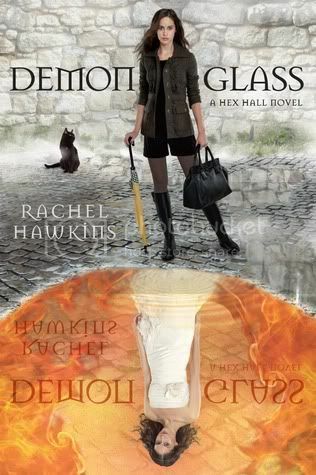 I really enjoyed reading Hex Hall,but my library doesn't have Demonglass. Sophie's snark was this books saving grace. I also loved this book :) For me it was even better than the first one. I'm glad you liked it too. And it's a great review :D I can't wait for the sequel now! I really need to read Hex Hall. I've had it sitting waiting patiently for me. Great post! I loved Hex Hall and just got Raising Demons (the UK title for Demonglass) this last week. Now I really can't wait to see how Hawkins builds on the solid start she gave her story. I LOVE this book. Archer is one of my favorite love interests. And Sophie is awesome. Wonderful review! This is indeed a fantabulous series! And this book really stepped up the excitement and intrigue. Can't wait to see what happens next. Thanks for a great review! Yes, I agree! Demonglass is absolutely awesome! Sounds like an awesome read that I need to add to my pile. I am going to have to read the first one before I dive into this one though. Great review! Succccccccccch a good book! So glad you finally got the chance to read it! I'm DYING for Triple Hex here!! !